Our Bathroom Cleaner is a strong formula specially designed to work wonders at removing grease, grime, soap scum and tough dirt in your bathroom. It contains no phosphates, nitrates, NTA, sulfates, sulfonates, caustic or other known pollutants. While the advanced formula lifts and traps dirt molecules, it leaves behind a clean you can see, and a fragrance you will enjoy. Grapefruit has long been coveted for its fresh, anti-odor, and clean qualities. Why bring toxins into your home? 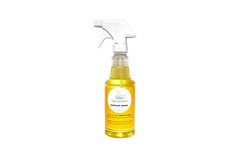 This natural bathroom cleaner is safe for use around people and pets. Non-toxic cleaners are superior to harsh toxic chemical cleaners for Indoor Air Quality. Our formula contains no chlorine and leaves behind no harsh chemicals. It is a cleaner, safer and more fragrant way to disinfect your bathroom. Ingredients: Natural plant-based surfactants, natural spring water and a natural essential oil blend, including Lemon Oil, Grapefruit Oil, Orange Oil and Tangerine Oil. Organic & Nature's Bathroom Cleaner contains no animal byproducts. Available in Grapefruit, Lavender, and Unscented.